Poised to cut the ribbon to dedicate University Classroom and Business Building, home of the Insperity Center, are (from left) John Antel, UH provost and executive vice president for academic affairs; Gage Raba, UH System Board of Regents member and Bauer MBA candidate; Roger Welder, UHS Board of Regents member; Latha Ramchand, Bauer College dean; Richard Rawson, Insperity president; Welcome W. Wilson, Jr.,UHS Board of Regents member; Renu Khator, UHS Chancellor and UH President; Welcome Wilson, Sr., former Regent; Nelda Luce Blair, UHS Board of Regents chair; and Michael J. Cemo, former Regent. 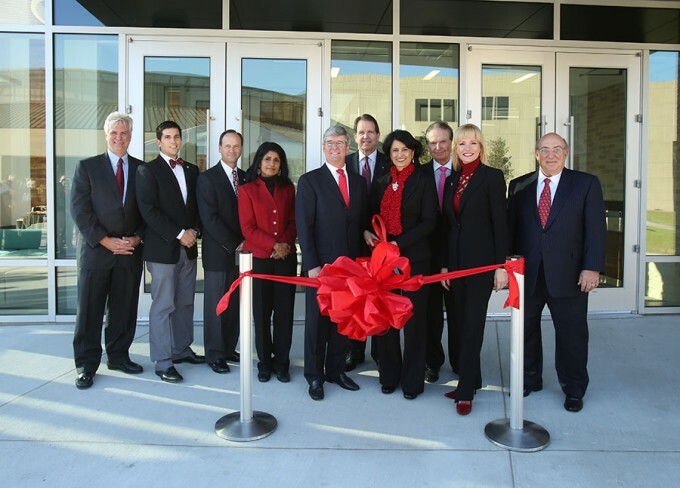 The University of Houston continued to bolster the professional corridor of its main campus on Wednesday with the grand opening and dedication of University Classroom and Business Building, home of the Insperity Center, a facility that will in part provide expanded classroom and student meeting space for the C. T. Bauer College of Business. The building is part of a $1 billion construction program on campus, which includes a new football stadium, basketball arena and other facilities to transform student life and learning. Student success ultimately leads to economic growth and community connectivity, said University of Houston System Chancellor and UH President Renu Khator. Enrollment at Bauer has increased in lock step with its recent national rankings and accomplishments, creating a need for additional academic and meeting space. About 5,600 students enrolled at Bauer in Fall 2008. The Fall 2011 total jumped to 6,278. As she addressed the crowd gathered for the building dedication, Khator also lauded the growth of the college over the past decade, jumpstarted in 2000 with a $40 million gift to name the college from Charles T. “Ted” Bauer. The connection between academia and business is evident in the new building, which houses the Insperity Center. The grand opening event served as a means to recognize Insperity, a leading provider of human resources and business performance solutions. The company provided the lead gift for the building and has an ongoing partnership with the university that includes a Business Performance Advisor certification program delivered by Bauer College. Khator reflected on the importance of the university and Bauer maintaining strong relationships with the business community, recalling her first day on campus five years ago, which she spent at Bauer to announce the naming of the Cyvia and Melvyn Wolff Center for Entrepreneurship, a program that will now be housed in the new building. Donors and partners like the Wolffs and Insperity President Richard Rawson are integral to sustaining the success of the university, she said. Rawson is a 1972 Bauer graduate and serves as chair of the Dean’s Executive Board for the college. “Things have changed a lot since I took classes, but one thing that hasn’t changed is the commitment of this university to the city of Houston,” Rawson said. The five-story building is located in the heart of the UH campus near Melcher Hall, Calhoun Lofts and Cemo Hall, forming a courtyard that provides higher visibility for Bauer College. It houses graduate and undergraduate teaching spaces, clinical faculty offices and student meeting areas for Bauer, and will also be used for other general academic purposes, including the UH Writing Center. Construction on the five-story building began in 2009, with some services offered this fall. The full building will be open in time for the Spring 2013 semester. The building will not only provide expanded services for students and the community, but it also serves as a tribute to former Bauer Dean Arthur Warga, who led the college from 2001 until early 2011 before passing away, said John Antel, UH provost and executive vice president for academic affairs. The building was designed by global architecture, planning and strategic consulting firm Gensler. Their vision included state-of-the-art classrooms and a mixture of formal and informal learning and collaboration spaces, as well as a learning center on the fifth floor inspired by the Rose Reading Room at the New York Public Library. The University of Houston, Texas’ premier metropolitan research and teaching institution is home to more than 40 research centers and institutes and sponsors more than 300 partnerships with corporate, civic and governmental entities. UH, the most diverse research university in the country, stands at the forefront of education, research and service with more than 35,000 students. 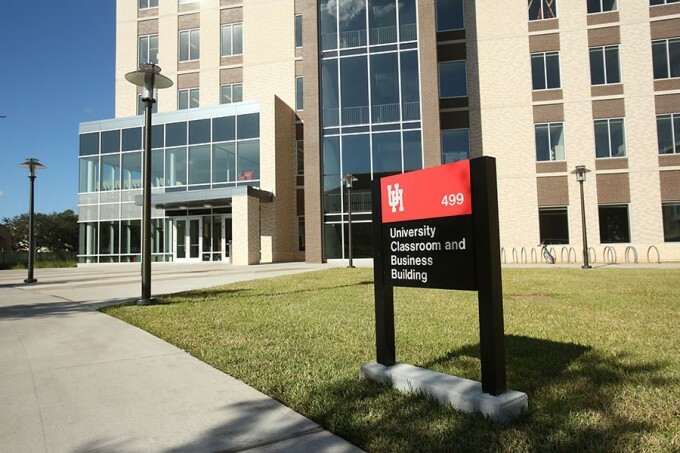 The C. T. Bauer College of Business has been in operation for more than 60 years at the University of Houston main campus. Through its five academic departments, the college offers a full-range of undergraduate, masters and doctoral degrees in business. The Bauer College is fully accredited by the AACSB International – the Association to Advance Collegiate Schools of Business. In August 2000, Houston business leader and philanthropist Charles T. (Ted) Bauer endowed the College of Business with a $40 million gift. In recognition of his generosity, the college was renamed the C. T. Bauer College of Business. Insperity, a trusted advisor to America’s best businesses for more than 25 years, provides an array of human resources and business solutions designed to help improve business performance. Insperity™Business Performance Advisors offer the most comprehensive Workforce Optimization™ solution in the marketplace that delivers administrative relief, better benefits, reduced liabilities and a systematic way to improve productivity. Additional offerings include MidMarket Solutions™, Performance Management, Expense Management, Time and Attendance, Organizational Planning, Recruiting Services, Employment Screening, Retirement Services and Insurance Services. Insperity business performance solutions support more than 100,000 businesses with over 2 million employees. With 2011 revenues of $2 billion, Insperity operates in 56 offices throughout the United States. For more information, visit http://www.insperity.com. Gensler is a global design, planning, and strategic consulting firm networked across 43 locations on five continents. Consistently ranked by U.S. and international industry surveys as the leading architecture and interior design firm, Gensler leverages its deep resources and diverse expertise to develop design solutions for industries across the globe. For its longstanding commitment to the advancement of sustainable design, Gensler received the Leadership Award from the U.S. Green Building Council in 2005. For more information, visit www.gensler.com.